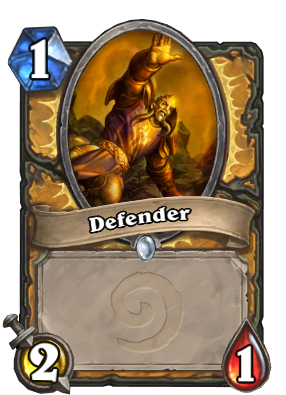 We will always remember you, "Defender!" This is such a weak secret and fragile minion, so it is unbelievable when the developers somehow make this minion's survive after it gets killed. Bravo! Also christmas 2016 is coming, it is now time for the Paladin starts to decorate Secrets Christmas Tree for this SEASON holidays!!!! MORE FUN SECRETS!!!!!!! NOW!!!! BEFORE CHRISTMAS!!!! WE NEED CHRISTMAS TREE PALADINS TO MAKE THE SEASON WHOLE! 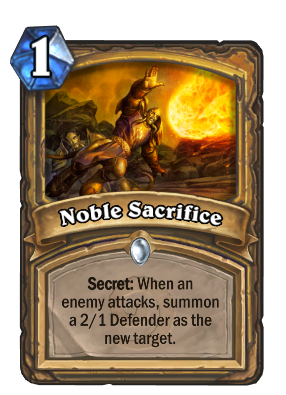 I am literally considering quitting Hearthstone because of this horrendously ridiculous card and secrets in general. This card's artwork is misleading. It shows the defender jumping in front of a spell but yet when an attacker casts a spell it doesn't trigger the secret. The only usable Paladin secret, which actually makes it a little worse since you'll always see it coming. EDIT: Mysterious Challenger came out over a year after this comment and proved me wrong once and for all. Avenge is also run a lot. I posted this before Naxxramas came out. But yes, Noble Sacrifice and Avenge are both quite good, especially in tandem.